Sumo Sushi & Bento announces the addition of two new dishes to their current winter menu with one-star ingredient - Salmon. While the guests can enjoy a selection of options to choose from Sumo's extensive menu, they can also try the succulent Princess Sushi Roll and perfectly seared Salmon Shiro Croquette introduced for the month of March. 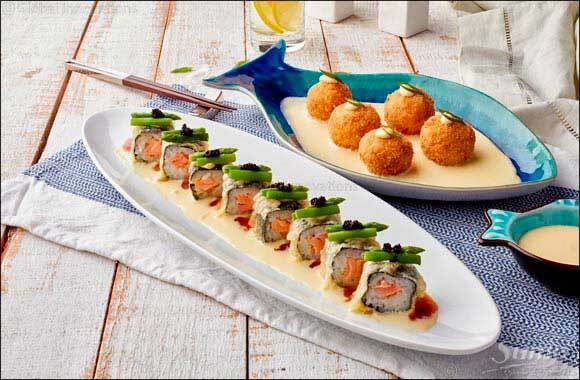 The Princess: Delicate and rich salmon roll, lightly fried and garnished with asparagus and black tobiko, all served with sweet chili and our smooth beurre blanc sauce. Salmon Shiro Croquette: Decadent bites of potato croquette fried and stuffed with salmon, onions, carrots, jalapeno and topped with green onions, served with our creamy beurre blanc sauce. Dine-in at any of the Sumo Sushi & Bento's outlets across the UAE or place an order via the mobile app for ease, convenience & rewards-based offers. The app is now available for iOS and Android phones in the app store!